A review of the game, with some nice photos. Courtesy of Board Game Geek. 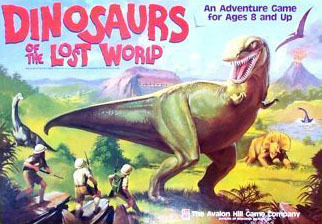 Dinosaurs of the Lost World is an advanced board game published in 1987 by Avalon Hill Games. It is based, more or less, on Conan Doyle's novel; the game-play takes place on the Lost World plateau, many of the sites are there, as well as a few of the elements alluded to in the book (for instance, one of the ways you can escape is via tarapaulin, aka: the failed balloon attempt). The game board is set up with an outside track running around the edge of the board, with the "chase track" and map of the plateau in the centre. On this map are placed 30 "Unexplored Area" hexagonal cards, which are turned over during the game to reveal various areas ("Tyrannosaurus Lair", "Ape Town"), traps ("Pit Trap"), items ("Lost Map", "Tarapaulin"), or nothing at all. Also included are plastic pawns for moving around on the map, 5 explorers cardboard cut-outs for moving around on the outside track and chase track, a bunch of dinosaur and creature cardboard cutouts, "Event" and "Experience" cards, and 15 comic book style "Adventures". The game itself is actually 3 games in one: the main game, the solitaire version, and the children's mini-game called "Dinosaur Round-Up". In the main game, you must circle around an outside track, which tells you what actions to do ("move a creature", take an "event card, etc.) and how many hexes to move on the map. It is on the map where you move around and uncover the "Unexplored Area" cards to find what's there, as well as get attacked by dinosaurs. Instead of taking the afformentioned turn, you can also opt to do one of the "Adventures", provided you're on the right tiles. To make a long (and I do mean long) story short, the object of the game is to be the first to escape the Lost World with 25 Victory Points, which you gather through the game by discovering things, collecting specimens and so on. The solitaire game plays the same, with a few minor rules variations, and a limit of 40 turns before the everpresent volcano erupts and kills you and everything else on the plateau. The children's game only uses the map board, and the goal is to fight and collect more dinosaurs than anybody else. To say the game is complex is an understatement. The rules were practically indecipherable, but when I got to playing it, I found the main problem was keeping track of everything you had to do. Each turn consists of 2 "mini-turns", one on the outside track and one on the map. In each of these there are all sorts of little things to do: pick up cards, move this, look at that, get attacked, and on and on and on. The "Adventure" comics are like a mini-game within the context of the greater game, and take up one whole turn. You trade the complexity of the 2 mini-turns with a whole little set of rules and cards and such. This isn't a hard game necessarily, just be sure to have the notepaper they suggest you have, and be keen enough to know whats what. The solitaire game is a bit of a rougher, due to the increased complexity of moves (on top of your 2 mini-turns, you also have to move dinosaurs around with their own set of die roles, PLUS keep track of your turns) and the 40 move limit. One interesting side effect is how the game actually fills out the ecology of the Lost World. In the novel, only a handful of prehistoric creatures are mentioned or alluded to (Megalosaurus, Iguanodon, Stegosaurus, Pterodactyl, Phorusracos, ape-men, Irish Elk, Glyptodon, and Elasmosaurus). However, to add some variety to the game, Avalon Hill has added all sorts of little things, such as Trilobites, Cooksonia (the earliest vascular plant), Arthropleura (a 6 ft. long millipede), Lepidodendron (a monsterous club moss the size of large trees), Dunkleosteus, and more. Unfortunately, they added some animals which I wouldn't have by virtue of their obscene popularity (Tyrannosaurus) or unlikely sustainability beyond the extreme range of suspended disbelief (Apatosaurus, Brachiosaurus, and Ultrasaurus). However, these additions provided some interesting food for thought concerning the Lost World ecology and artistic inspiration for new scenes.